(TB2QABJ) Look Twice Geocoin - STOLEN!!! Todie's Wild Ride: Why didn't I see that motorcycle? STOLEN!!! Todie's Wild Ride: Why didn't I see that motorcycle? Use TB2QABJ to reference this item. This coin is part of a huge mission to raise awareness of bikes (both motorized and human powered) on the roadways. 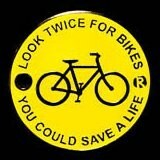 Many motorists ask themselves this question AFTER an accident involving a motorcycle; WHY DIDN'T I SEE THAT MOTORCYCLE? The biggest thing is that motorcycles are much smaller and harder to see than motorcycles. This is the leading cause of auto vs. motorcycle accidents. So we as drivers need to be more aware of the fact that motorcycles ARE harder to see. So we need to take the responsibilty and make sure that we are more aware of our surroundings and especially that we are more aware of the many motorcycles around us on the road. Gallery Images related to STOLEN!!! Todie's Wild Ride: Why didn't I see that motorcycle? Picked this coin up on the final cache of a two-day four-state multi-cache bananza across the southwest. I will drop it off ASAP in a cache on my next excursion.